I made this little bag for the shepherd costume this evening. 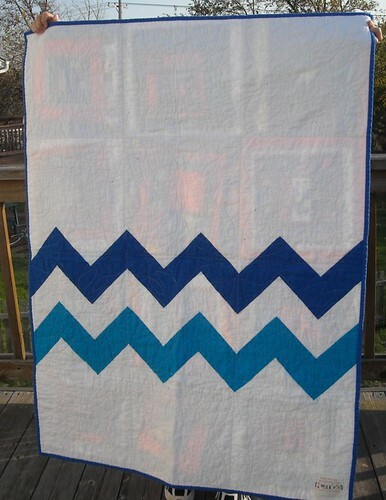 I didn't have a lot of fabric to work with but I think it turned out pretty good. I couldn't face the fur again today... first thing in the morning though, I'm going to get the vest done so I can show you the entire costume, along with a photo from the book to compare. This is the skirt (I can't think of a better name for it, sorry) part of a shepherd costume I'm making for part of the church Nativity program this weekend. The fur was much more messy than I had anticipated. 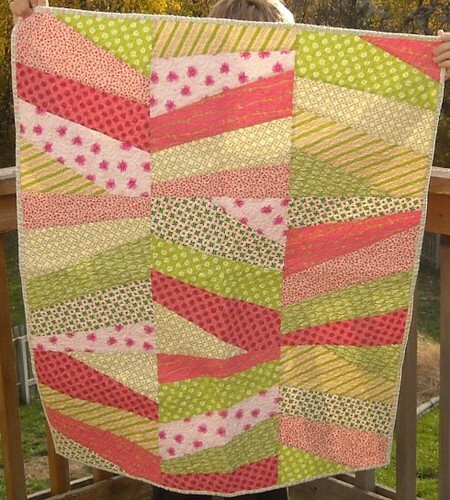 I liked cutting it into the ragged shape. It is supposed to match an illustration from the book When Jesus Was Born in Bethlehem. Also! 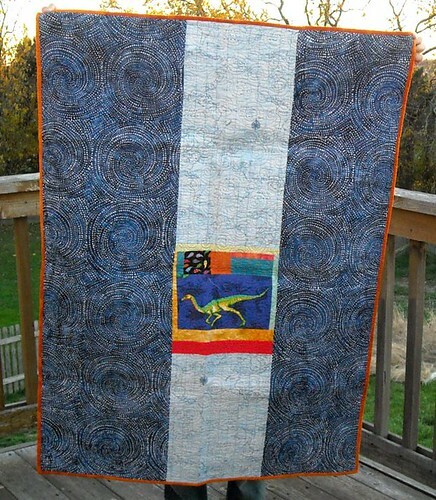 I finished the binding on my 9-patch quilt. I went out to take a picture before the sun went down, but it was too windy. I'll try to get good pictures of the whole thing tomorrow. My 8-year-old neighbor asked me what day I started it, and I told her I started it in 2009. I'm glad to get it done, ready to move onto the next big thing! 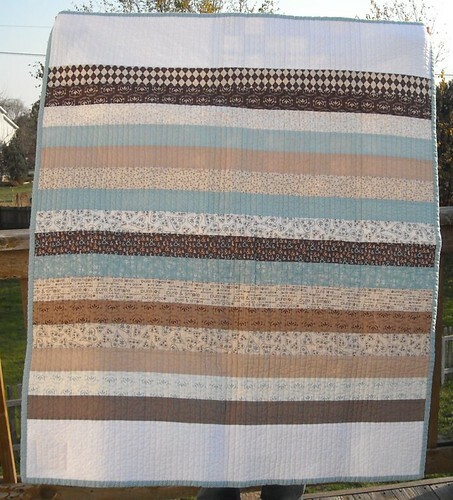 I'm glad I asked about straight line quilting here; I think I've learned some things that will help me improve in that area next time I decide to quilt that way. I'm linking up at Amy's One Thing, One Week Challenge. 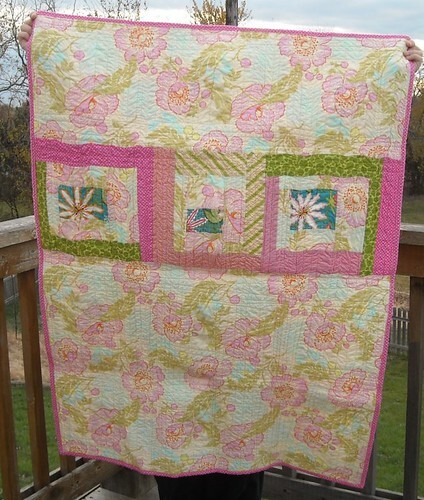 Finishing this up was my goal a week ago--I did it! I had some good down time today. I have a lot of things I need to do/sew/write in the next couple weeks and last night right before bed I made a very satisfying list of all the tasks, each broken down into steps. I think I can get everything done without too much stress, if I go about things in an organized manner. :) I have my plan for tomorrow which, gulp, starts with me getting up early and going running before my family gets started for the day. I have not historically been very good at a) going to bed very early and b) getting up early, but I think that getting up in the morning (two weekdays each week) is going to be my best option for keeping up with my exercise routine that I've been pretty good at maintaining over the last 2 1/2 to 3 months. I think I can do it, I know I can. I will get my running clothes all laid out in a bit here before I go to bed. I need to write down my 1st grader's reading minutes from this last week and that is all the homework he had over the break. Tonight I was lying down with him before he went to sleep and he reminded me that we needed to read. I went to the e-reader app on my phone and we downloaded The Brothers Grimm and The Wizard of Oz. In my mind it wasn't that long ago that we read the first 5 Wizard of Oz books; really it was probably 2-3 years ago, long enough that he doesn't remember. Anyway, we read Rumplestiltskin and Chapter 1 of The Wizard of Oz. I hope he stays interested and we can finish The Wizard of Oz; it's such a good book! We also started the task of the Christmas tree today. Putting light strings on a supposedly pre-lit tree is not that fun. I'm going to have to get one more string of lights and then we'll put ornaments on with the kids tomorrow evening. Oops. Has this ever happened to you? 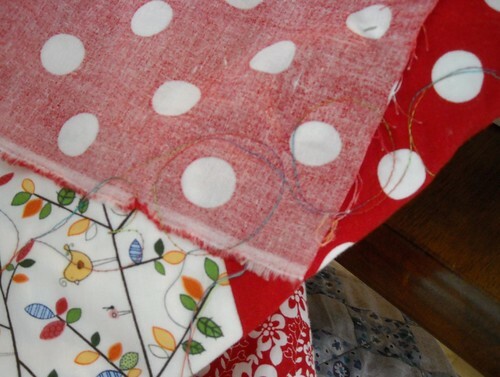 The red polkadot strip in the backing was about 4" longer than the other backing pieces. 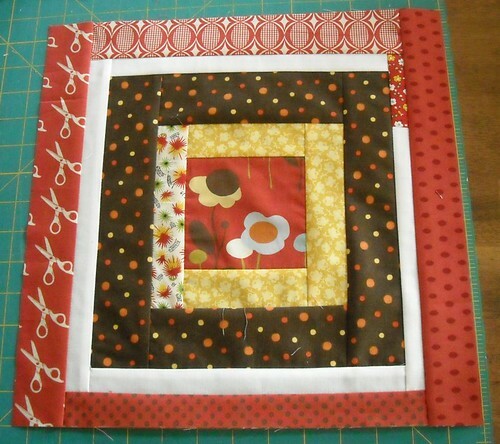 It got folded over and caught in the quilting. 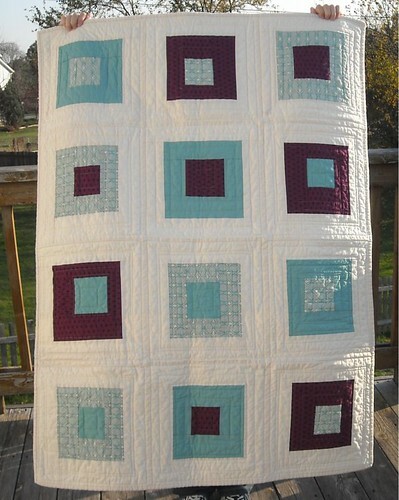 The cute, circular quilting. Pretty funny, huh? 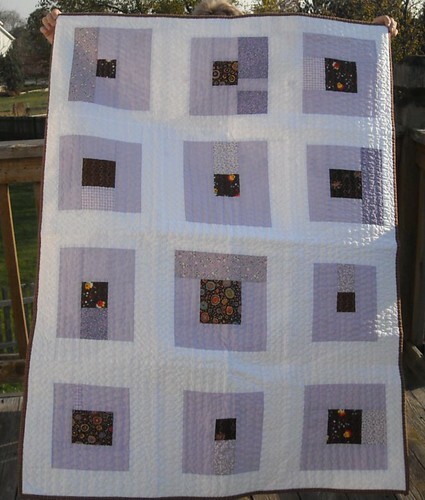 I guess I will undo the stitching and requilt it. 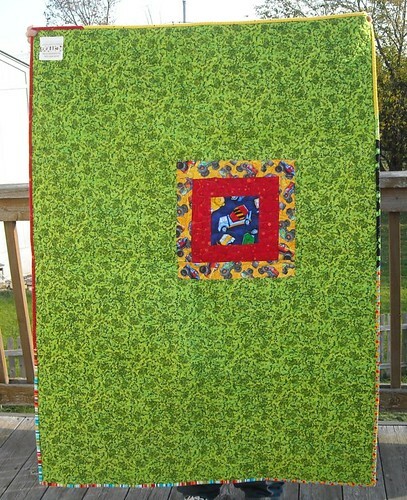 I've started putting the binding on this quilt. It is about 60"x84". 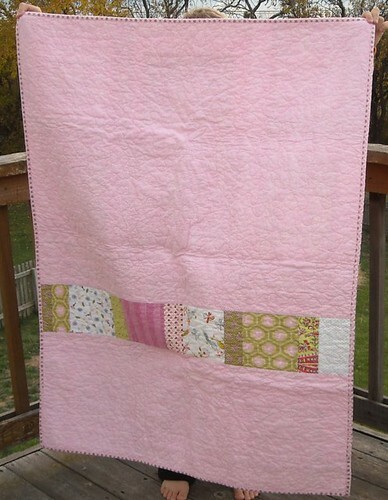 I am getting batting for it tomorrow and will work on the back soon too. I hope you all had a wonderful Thanksgiving! We had a good day--watched the big parade on tv with the kids, had a yummy turkey dinner that was just the right amount of work, and watched the Charlie Brown Thanksgiving show, too. I have a kind of long sewing-related to-do list, and I made some good progress today. 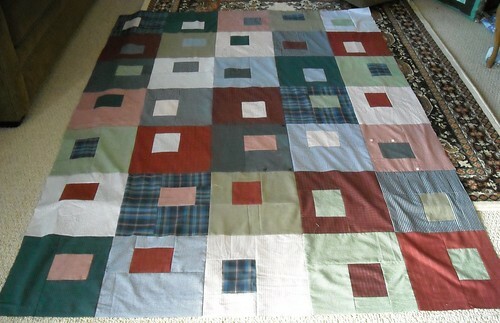 Grandma's quilt top is almost done! it was in about 50 pieces this morning, and now it's 3 big pieces. You would think I could have got it all put together, but it'll have to wait until morning. I haven't decided whether to show it here or keep it secret until after Christmas. We have a 3rd kid with the stomach bug that the others already had. I feel so bad for him, especially because he's sick on the holiday. I hope he feels better quickly. *Did Turkey-day grocery shopping today. 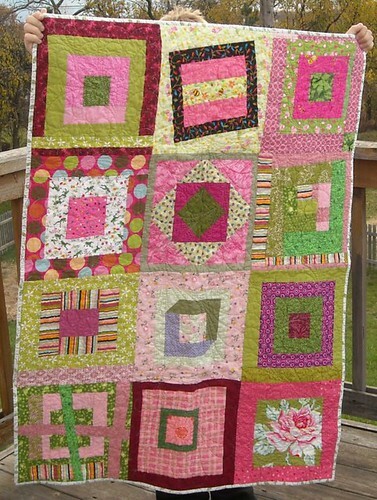 *Sewed 10 more blocks for Grandma's quilt, only 5 left. *Did Week 5, Day 3 of Couch-to-5K, yes, I ran 20 minutes without stopping! I love running without the stroller. *I need to google defrosting and cooking info for a 9 lb. turkey. 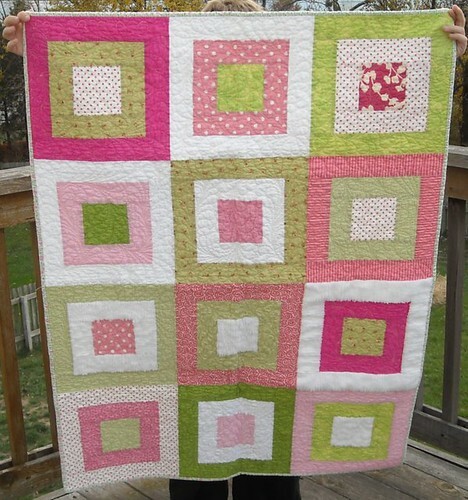 I spent a good chunk of time quilting this quilt yesterday and got a good start today too...and then I ran out of thread. I had a kiddo staying home from school with crummies in his tummy (name the book!) so I couldn't go out for another spool of thread today. 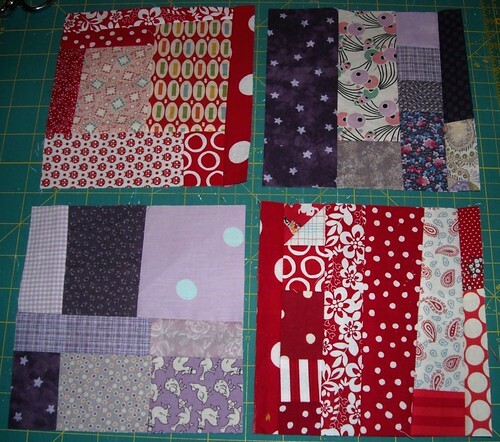 I did get all the rest of the quilt blocks cut out for Grandma M's quilt though which feels pretty good. 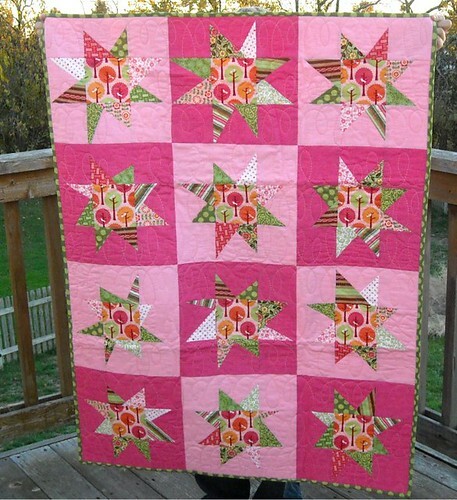 I feel like I understand why it works better on the diagonal because of the way fabric behaves and stretches and shifts on the bias, but it seems like lots of quilters do straight line quilting with the fabric grain that doesn't distort or shift the quilt layers, and I'd love to figure this mystery out and improve my straight line quilting skills. 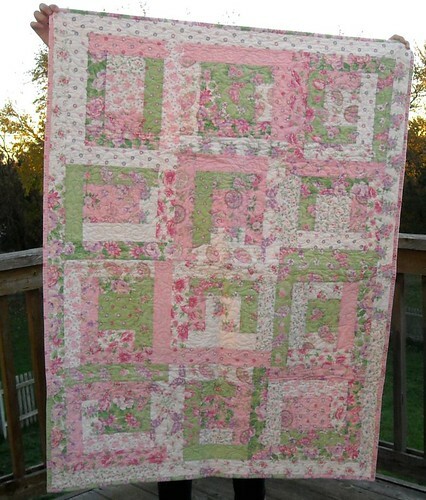 So, my question is, if you are successful at straight line quilting, how do you do it? Do you use a special basting technique, special sewing machine settings, special sewing machine, period? Or is it something else I'm not thinking of? 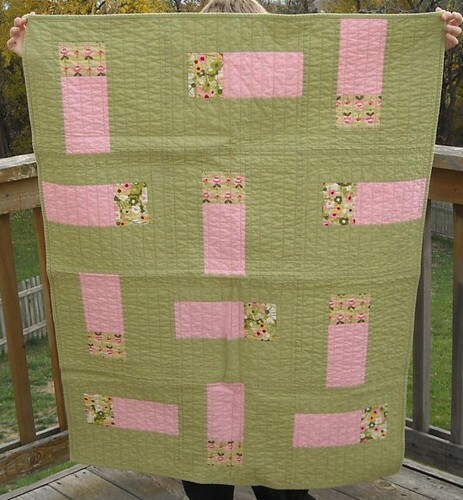 I would love to hear your tips and suggestions for successful straight-line machine quilting, especially if you can do it without the layers shifting! Monday mornings and my almost-alone time after the busy-ness of the weekend. How my boys always have so much to tell me in the car on the way home from school. My husband who brings home the bacon and is such a great guy. Nice weather, good health, warm blankets. 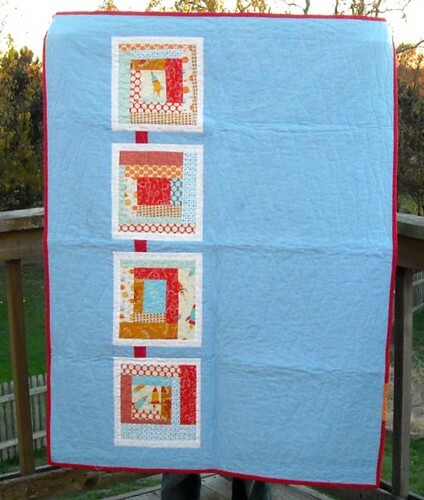 Natalia is hosting a little Thankful link-up this week; thanks for the great idea, Natalia! 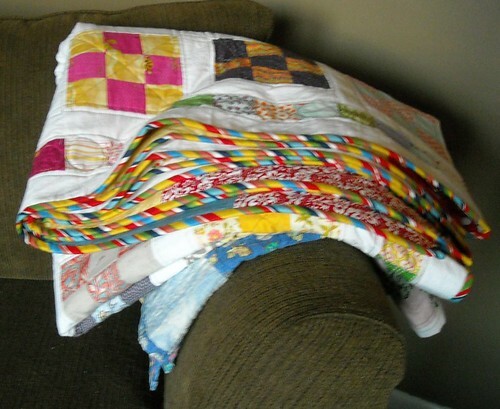 The March of Dimes coordinator told me that there are 18 babies in the NICU right now so our contribution of 27 quilts will be enough for everyone there now and they will distribute the rest of the quilts as new babies come in. 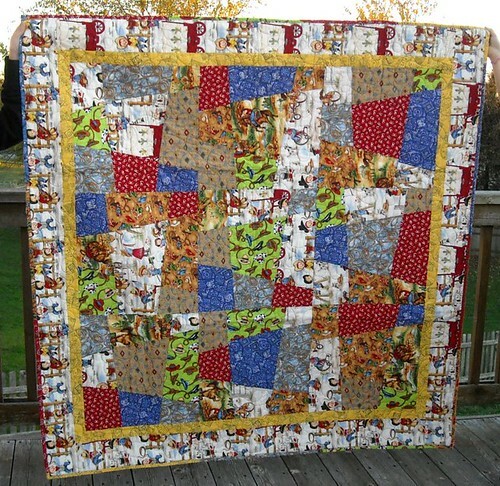 During the time we were there, only a few moms came in and picked out their quilts, but the March of Dimes volunteers will make sure that all the families get quilts for their babies over the next few days. 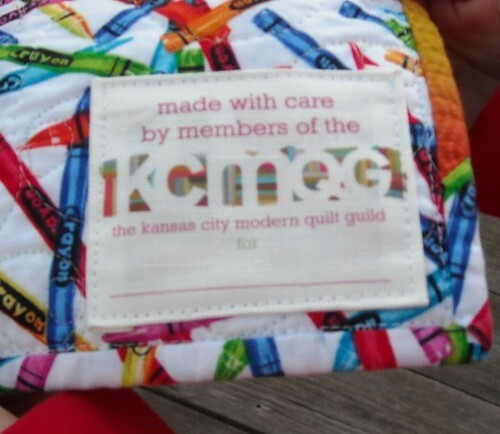 Thanks again, so much, to the Kansas City Modern Quilt Guild for agreeing to take on this project and working so hard to create all these beautiful quilts. Also, thanks to my mom and my friends Kim and Barbara who are not members of the guild (yet?!) but helped with the project as well. 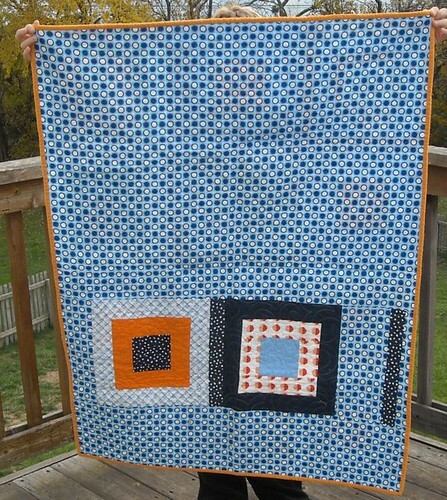 I am so happy this project went as well as it did and I'm grateful for everyone's generosity with their time, energy, skills, and fabric! 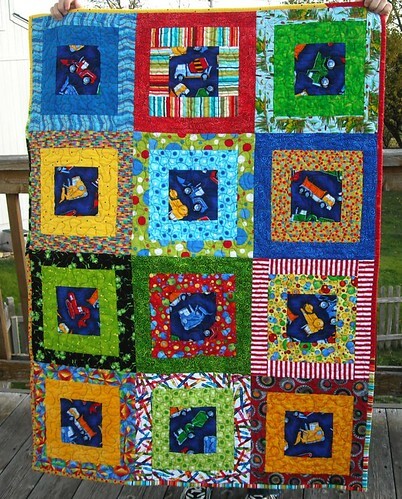 The flickr group with all the quilts made for this project is here. 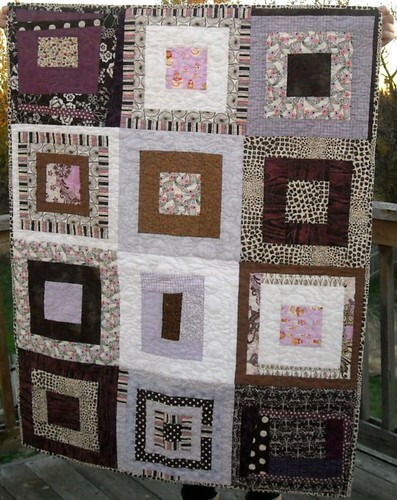 Lavender/brown quilt made by Jaime. 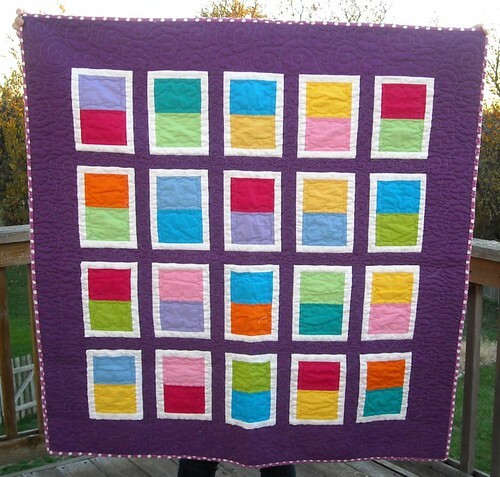 Purple/aqua quilt made by Shea and came in today's mail! These will be delivered to the babies and their families at the NICU at St. Luke's tomorrow! 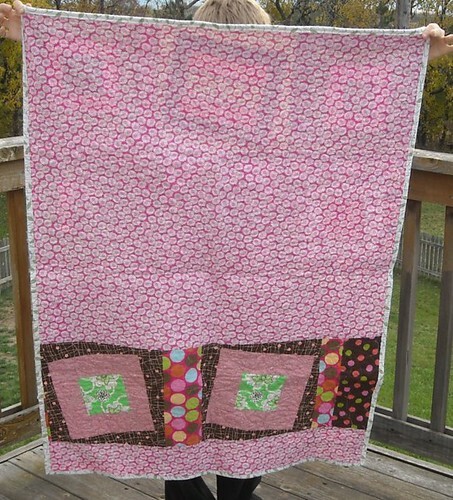 Here's the flickr set of all the donated quilts made by KCMQG members. Thanks so much to everyone who helped with this huge project! These two are for Amy who is the woman of the month in Bee Beautiful. 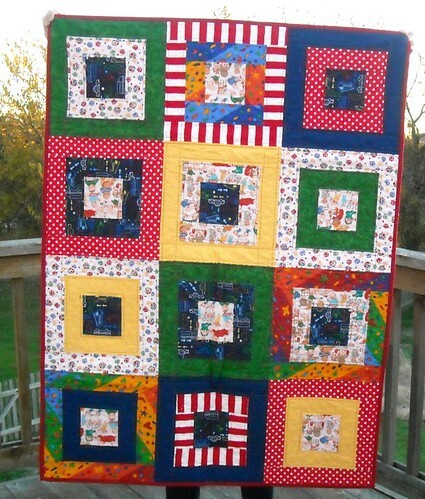 I like the primary colored one best--and it's not the best photo due to being finished after sunset. 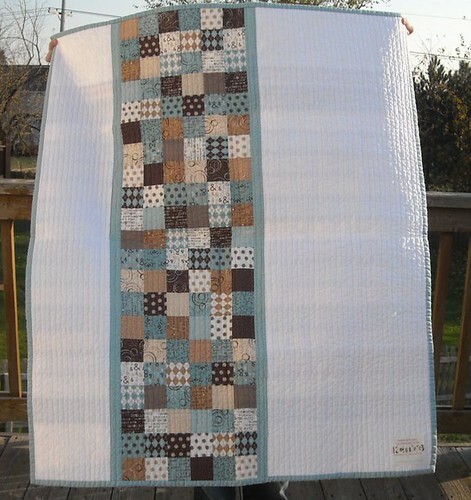 I think I have a plan for these, for after I finish some other things and make a few more blocks in other colors. I also worked on the toy/basement declutter and did some vacuuming (and got a kid to vacuum, too.) Will vacuum more tomorrow. And tended to my girl who's feeling somewhat but not all the way better. Oh yeah, I had a question for you! 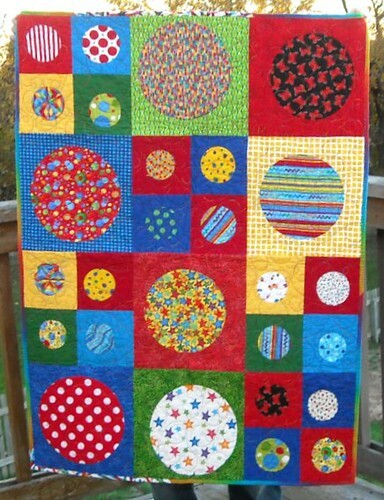 What's a good seam ripper? 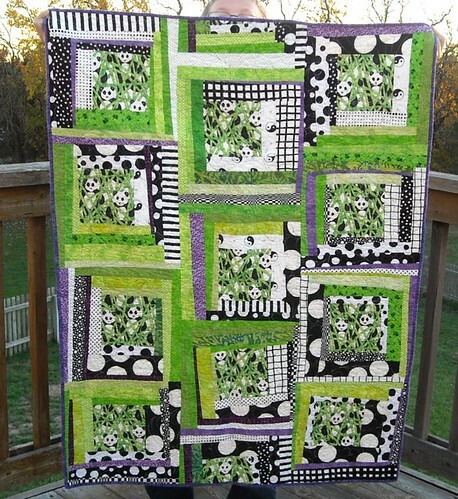 I got the cheap Dritz one after it got a decent review in Quilter's Home a while back, and it is not cutting it for me. Not pointy enough. My old thread snippers were good for cutting stitches, but I've replaced them and the new ones are also... not pointy enough. 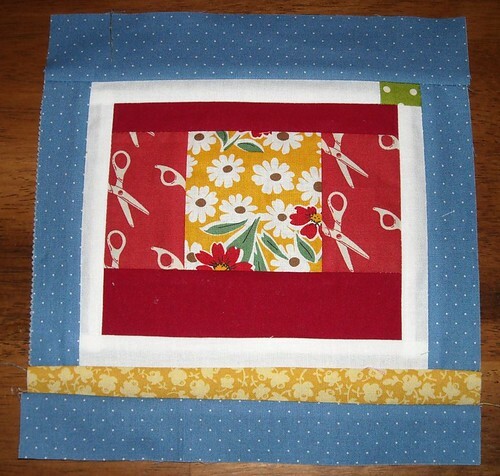 Do you have a seam ripper that you'd highly recommend? Tell me about it! 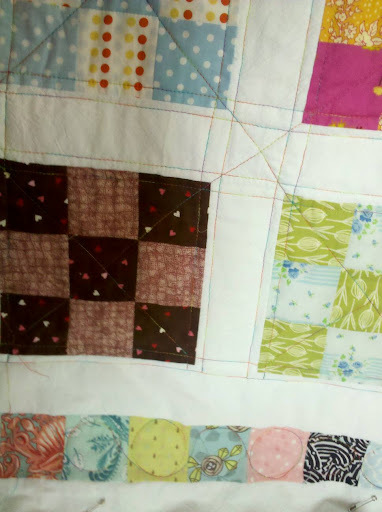 I'm still plugging away on not-very-exciting straight line quilting and sewing labels on charity quilts. I also spent a large chunk of time decluttering and organizing the toys today. There were so many little pieces and old batteries that I was happy to throw away but wondered why they were still around. I am thinking about making some kind of fabric basket or bucket or two, like this, maybe, for some of the toys we're keeping out. 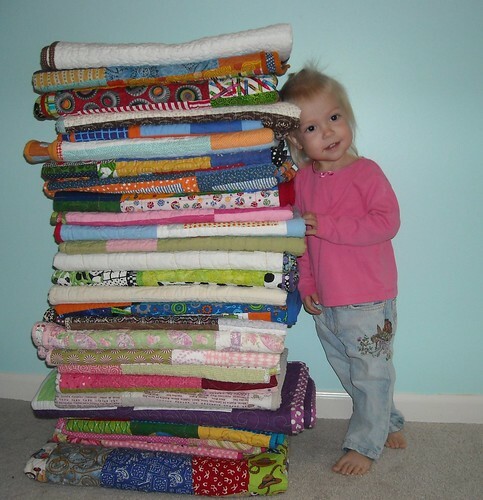 Anyway since I still don't have anything new to show you I thought I'd tell you about the Sewing Summit really quick. Have you heard about it yet? 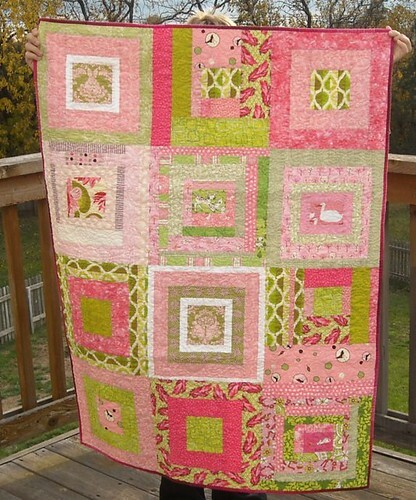 The Sewing Summit is going to be next October, in Salt Lake City, and is being organized by the fabulous Amy, yes, the Blogger's Quilt Festival Amy, and Erin, who is the mastermind of Quilting Bee Blocks and also blogs at Two More Seconds. They are still organizing the event but there will be sewing, and great speakers, and swag bags (I think), and networking for those of us who love to sew. You can read a little more about it here and here. So, yeah, I'm thinking I will be there. I can't say for sure 100% yet, but I'm hoping everything will work out so I can go. What about you--will you be there? 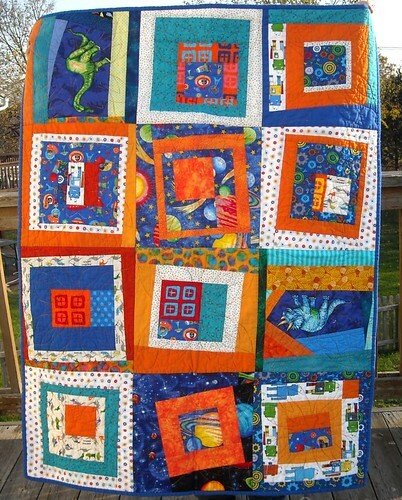 Here are 10 more of the charity quilts made by KC Modern Quilt Guild members. Again, these will be going to families who have babies in a local NICU in a few days. I had a couple of helpers available to hold up quilts shortly before the sun went down this evening. 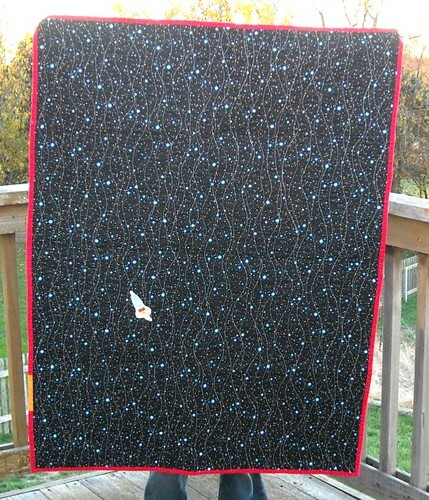 This panda one has a super soft minky backing that gives the quilt a really nice drape and weight. 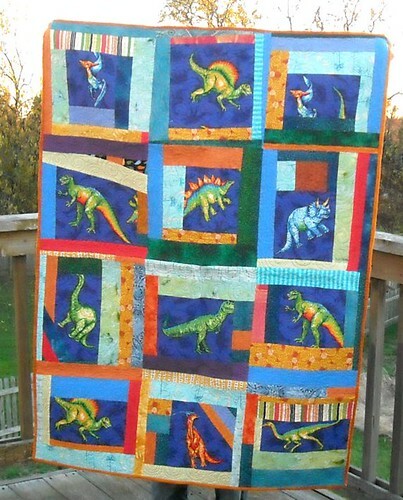 This is the back of the dinosaur quilt--cute! 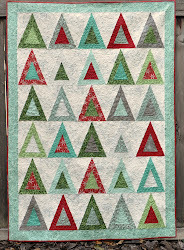 Such a fun surprise to see this little appliqued rocket ship! I never noticed it before today, when we were taking pictures! I have 5 of them done--must do at least 10 tomorrow. 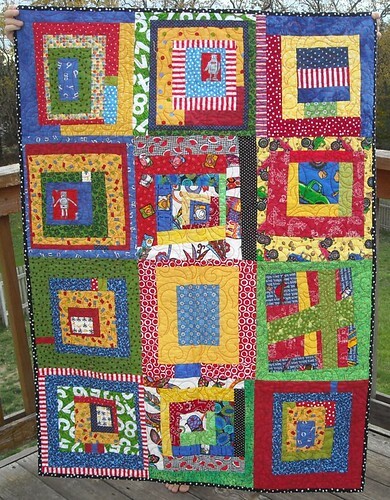 More of the quilts for this project can be seen here and here. 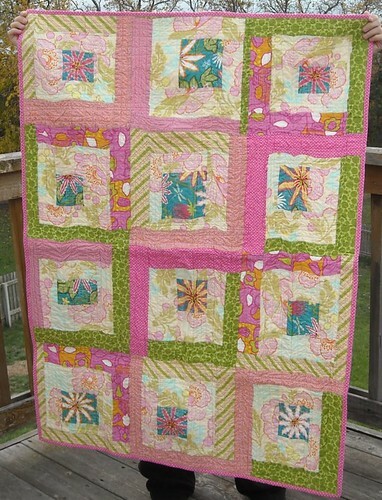 I will do one more photo post with the last few quilts later this week. 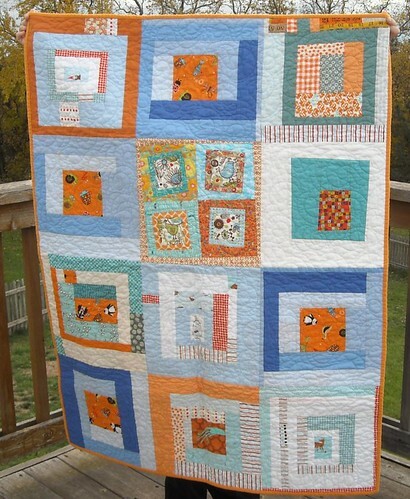 I finished this up for a sweet three-year-old friend this morning. It was nice to make this, so refreshing to work on a small project with a quick deadline and just be done with it. 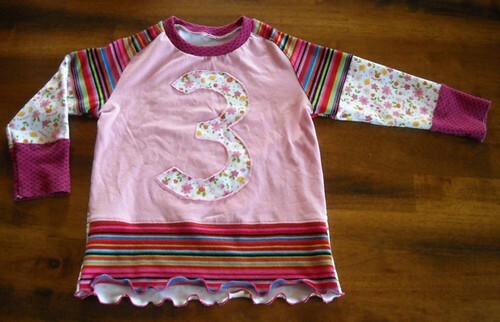 I had a couple hiccups with the lettuce edge hem--the back is made from the cotton floral interlock that the "3" is made from, and I was stretching it quite a bit, like I stretched the cotton/lycra stripe fabric on the other shirt I made in this style. But it was cutting the hem off as it sewed. So I got out a scrap of the interlock and realized it would still do the "lettuce" thing if I stretched more gently, and the hem wouldn't get cut off either. The sleeve hems are the original hems from the fuschia/heart shirt--I like doing that. Also, this is a boys' pattern and the sleeves on the pattern are much wider than the fuschia/heart sleeve ends were (it was a "large" girls' shirt, but close-fitting), so I had to taper them down quite a bit. 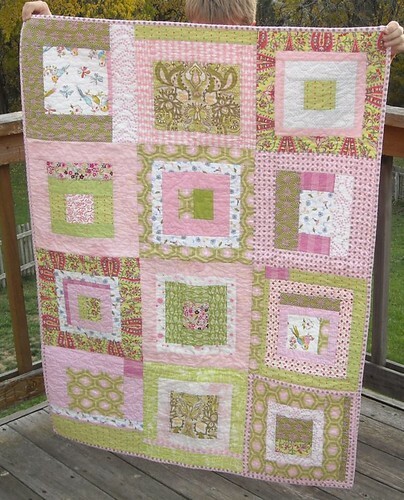 I hope it fits the birthday girl all right! I have 65 pages left in the book I'm reading, The Passage . It is very suspenseful, but not too scary, and sooo good. (yes that's an affiliate link yo.) I'm going to go see how it ends... and if I'm going to be dying that I have to wait until 2012 for the sequel. 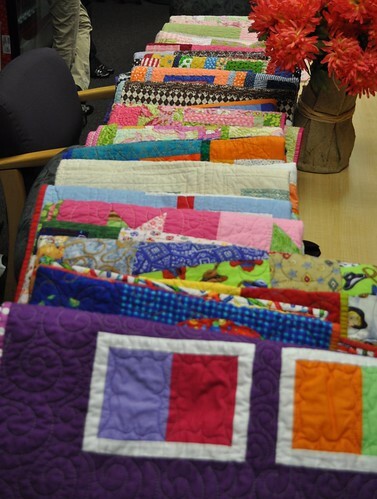 Here are photos of 10 of the charity quilts made by KC Modern Quilt Guild members this year. 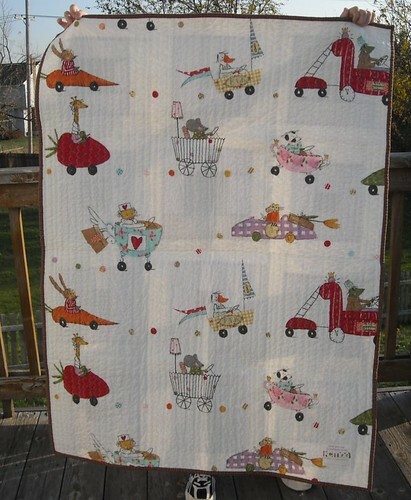 They will be delivered to parents at a local NICU later this month. 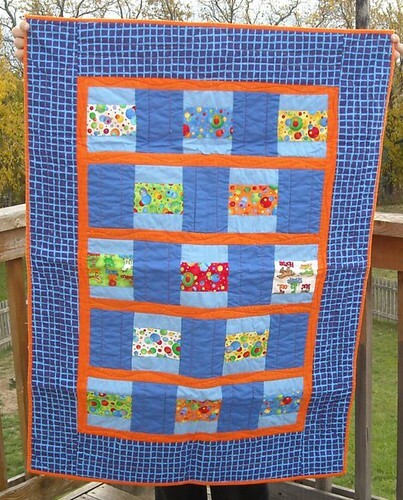 I will have pictures of more quilts later this week, too!